Clarify your thinking on an issue that can tear families apart!Caring for a Loved One with Alzheimer's Disease: A Christian Perspective is the touching story of a woman's daily struggles as a caregiver to her mother who suffers from Alzheimer's disease. You?ll learn how God's presence in her life has helped her. You will also find practical day-to-day tips for living with a loved one suffering from senile dementia and how your spirituality can make the journey easier for both of you. This important guide provides an honest description of the emotions you may be forced to come to terms with while dealing with a loved one or parishioner with Alzheimer's disease and how God's presence in your life can help lift that burden.Caring for a Loved One with Alzheimer's Disease gives you firsthand accounts of the stages of pain, despair, acceptance, and victory that you may experience while caring for someone with Alzheimer's to let you know that what you are feeling is normal and that God will help you overcome these challenges. Alzheimer's disease often goes undetected until its later stages. This informative book renders a clear description of the disease, alerting you to the known warning signs of dementia, and preparing you for the possibility of such a diagnosis.Caring for a Loved One with Alzheimer's Disease is filled with tips and suggestions to make caring for your loved one easier for both of you, such as: learning to separate the person from the diseaseresearching the disease and keeping informed about every aspect of this progressive and irreversible neurological disorderrealizing that you need emotional support and should seek help from your pastor, church care group, or best frienddiscovering how having power of attorney and creating a living will can prevent many problems in the futureunderstanding that to care for your loved one at home is challenging and that taking simple steps, such as "baby-proofing" your house, will prevent traumatic disastersturning your anger and guilt to positive energy and avoiding emotional drain and strainThis unique book offers you solace amidst the turbulence of caring for someone stricken with this difficult condition. Caring for a Loved One with Alzheimer's Disease provides an open and honest description of how faith can comfort and support you and your family while you care for someone with dementia. Caring for a Loved One with Alzheimer's Disease by Elizabeth T. Hall; Harold G. Koenig was published by Taylor & Francis Inc in January 2000 and is our 47450th best seller. 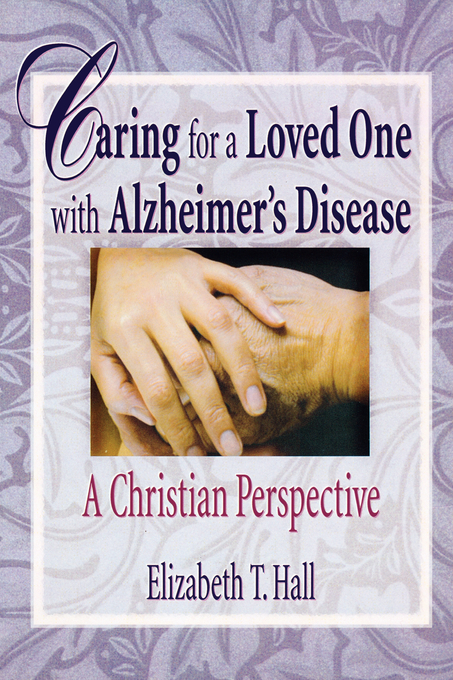 The ISBN for Caring for a Loved One with Alzheimer's Disease is 9780789008732. Be the first to review Caring for a Loved One with Alzheimer's Disease! Got a question? No problem! Just click here to ask us about Caring for a Loved One with Alzheimer's Disease.